Providing Local Leadership and Working For You. Providing Local Leadership: Managing Higher Density Development. 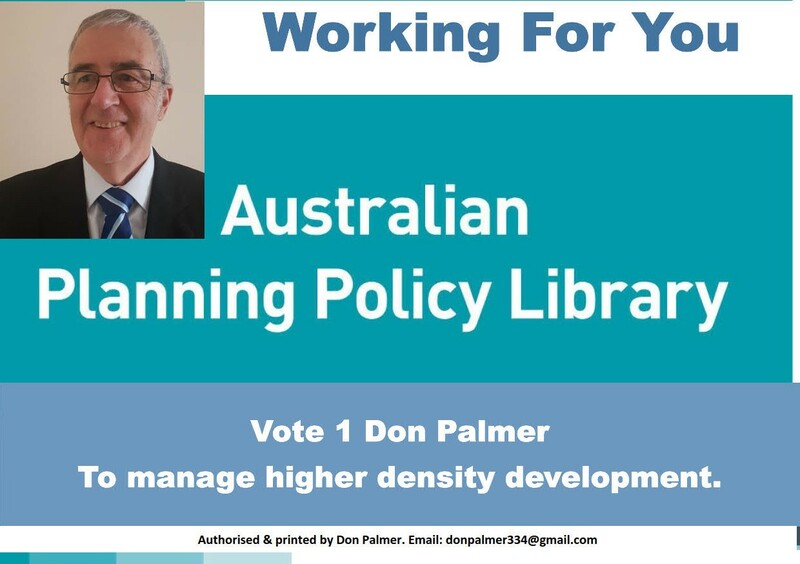 Managing higher density development in Clarence Park Ward commenced a few years back in the City of Unley . In particular the suburb of Black Forest was under threat of a development plan encouraging extreme high density development potential. Another suburb similarly exposed was Clarence Park. Providing Leadership most often is not determining for others what is best for them. It is providing them with the chance to make that judgement themselves. Beyond that, it is ensuring they take the opportunity to represent themselves. This is what I did, along with my co-councillor Jennie Boisvert, when DPA2 was out for public consultation. On the development front, the new and current government is proceeding in the same direction as its predecessor. In so doing we will see the evolution in the next period of time of the SA Planning Library. 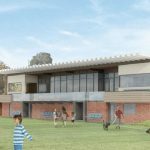 As the Government works on the SA Planning Library, Black Forest and Clarence Park will again come under the microscope. The Planning Library is all about having generic rules that apply across all of suburbia. Unless we work together (you & I) at the appropriate time local nuances will potentially be ignored. By providing local leadership I will help fight for a sensible planning solution. As in the past when first challenged with higher density, I will again work for you and work with you. And with the Government to seek the best solution that works for all. Authorised & printed by Don Palmer. 19 Kelvin Avenue, Clarence Park. Providing Local Leadership: Independent Elected Members not Party Political affiliates. Speculation is high that party politics have entered into the City of Adelaide elections. As a result, it is time to reflect on what has been great about local government in South Australia. That is that our councils are filled with independent elected members not party political affiliates. Certainly, this is the way it should be in Local Government. Let me start with stating that I do not have and never have had any party political affiliations. 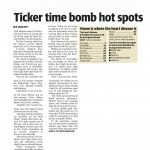 In my 8 years on Council there has also been no evidence of party politics in the Unley chamber. So, the members in that time did not have any party political affiliation. Certainly, if they did, it was never apparent to me. Elected members, having said, have put their hand up for State Parliament. These members have by so doing indicated a leaning one way or another politically. The former Mayor, Lachlan Clyne, did recently run for state parliament of the Liberal Party. His affiliation however never impacted, in my opinion, in the chamber. As Mayor, his role was limited to chairing the meetings. From memory he only ever had a vote on a handful of occasions, to break a deadlock. We read this week that the Greens have deplored the City of Adelaide Lord Mayor allegedly endorsing Liberal affiliated candidates in their election. So, they are apparently endorsing members of their party as candidates. Do you want your local government representatives being truly independent? What about keeping party politics out of the Council Chamber? Do you want independent elected members, not party political affiliates? If you do, I encourage you to seek a commitment from the candidates in your ward that they are independent. 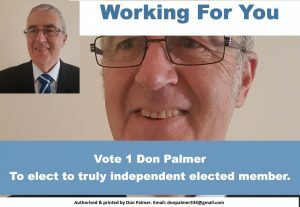 PS Vote 1 Don Palmer for a truly independent candidate. 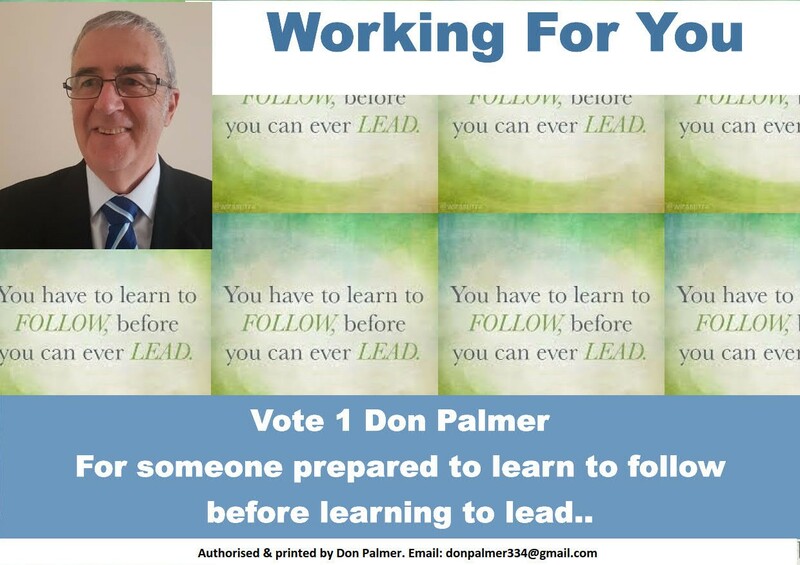 I have long been a believer that you need to learn to follow before you can learn to lead. Hopefully I have lived that philosophy. This means being able to listen. Whether it is providing local leadership by participating in the deliberations of Council or representing you in your dealing with Council I need to know what you believe the community needs. Once again, hopefully I have been a good listener. Of course, only you can testify whether I have or not. I know I have made mistakes along the way. On occasion maybe I have not listened that well. I am here to undertake that it will remain my objective to listen to you and to take your lead before representing you. You will find in this “providing local leadership” series of blog posts that my focus is to lead the deliberations. To have no set position on any issue. In other words I am recognising there is usually more than one view point. That we need to consider all the viewpoints before coming to a decision on policy. 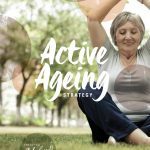 As you read through this series of blog posts I would appreciate your thoughts on the topics in question and others not mentioned. If you have thoughts I want to hear them. Happy to receive them before the election, or after. Seeking your views does not stop with the election. In providing your views please relay them to me either by phoning me or by emailing me at [email protected]. Unfortunately Local Government Election legislation forbids me from displaying your thoughts digitally in the lead up to the election if they can be seen as designed to influence the result of an election. The Goodwood Oval Grandstand redevelopment is moving toward construction. Detailed designs suitable for a development application are underway now to allow this. To get it to this point there remains much work to do. The Council and its community need to oversee this step and indeed the construction process itself. I am looking forward to providing the leadership to ensure the best result. Our community needs an up to date, safe and inclusive Goodwood Oval. 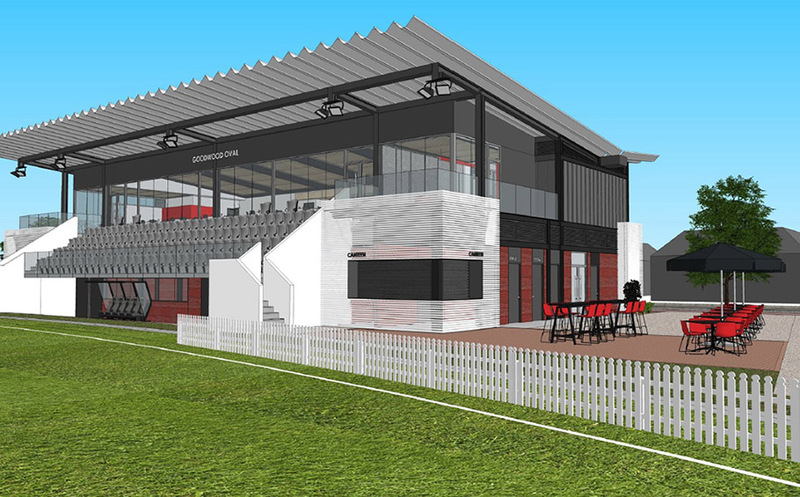 The Grandstand Oval Grandstand redevelopment needs to accommodate the needs of both the Football & Cricket Clubs. Particularly with the advent of female participation in both sports. A venue that is safe & hygienic. A venue that is welcoming. Ideally it should provide a better watching environment for the supporters of both clubs. A venue that provides watching in comfort in all seasons. 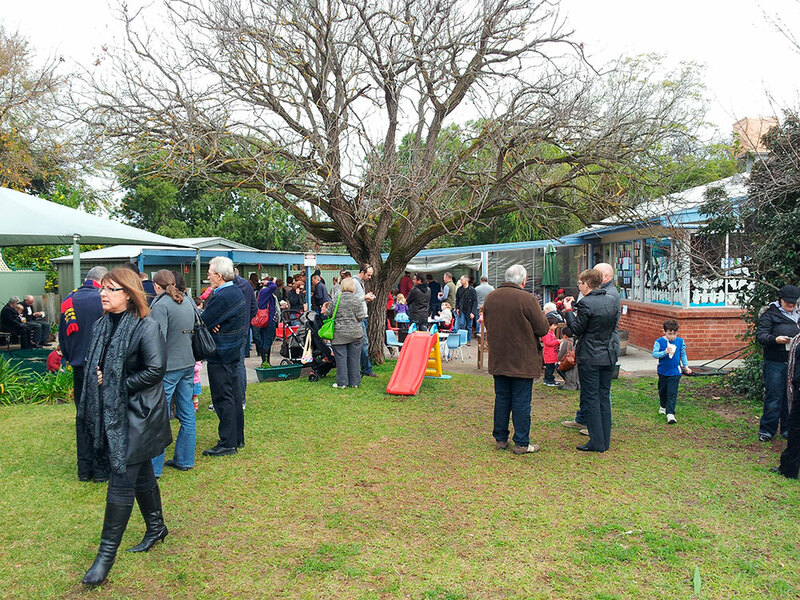 It should also be a venue for the use of the wider Clarence Park Ward community. Other City of Unley community groups should be able to access the venue when not in use by the clubs. Why can’t it be a venue that can be used by Council and/or the local residents. Finally, it needs to be a venue that fits into the landscape and compliments the amenity if the area. The next Council, not the current Council, will be responsible to sign off on the final design. That is the design that will be built. 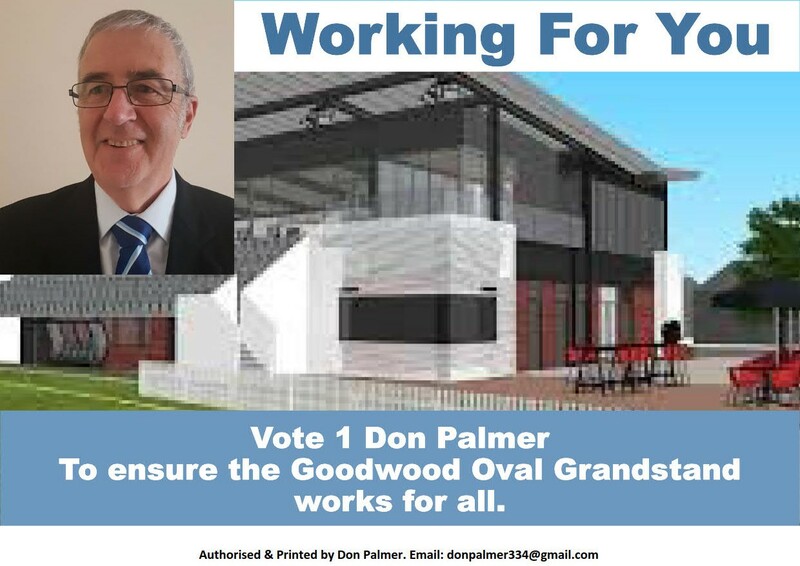 I undertake to continue to providing the leadership needed in working for you and with you to ensure the Goodwood Oval Grandstand Redevelopment is the best solution for our whole community. For all we have achieved together, as I noted in my last blog we have much still to achieve into the near future. For a glimpse into the future read on as I summarise what I see as the challenges going forward. Challenges which requires proving local leadership. 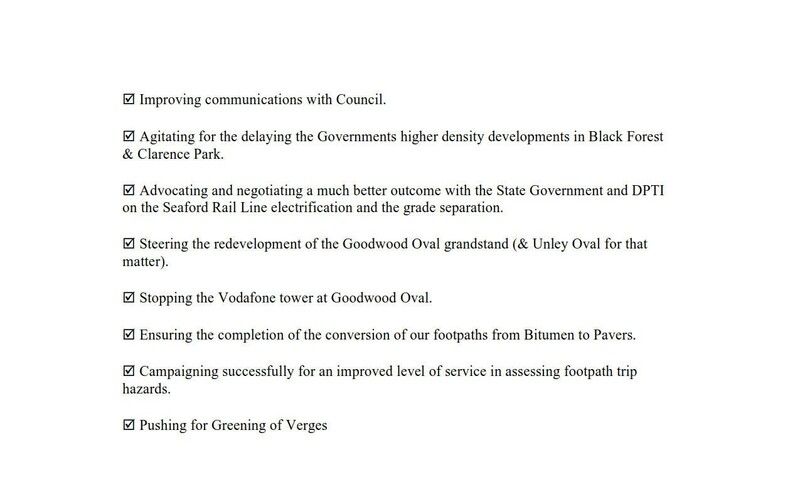 The following summarises what lies ahead of the Clarence Park Ward. Watch for future blogs over the next couple of weeks for more detail. Since Jayne Stinson secured a $2.0m grant from the previous government before the last State election much has happened. Much is still left however to do at Goodwood Oval however. I will release a series of blog posts in the next couple of weeks addressing each. As the club marches toward its centenary it desperately needs a new clubroom. A future blog will review this in more detail. Watch for a future blog as I explain the need for continued vigilance to ensure any changes to our development plan are respectful of the amenity will all currently enjoy. Business and economic development for an area is a shared responsibility. Council should take the lead. I am looking for Council to consider all of its businesses, including the forgotten majority. 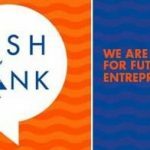 The home based businesses. 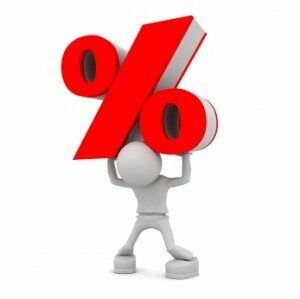 Rate Capping as one of a number of financial measures in setting our budget, and therefore the rate, ensures financial responsibility. Setting the rate first and cutting our cloth to suit. This must be done by Council with you providing the oversight, not a State Government external body. Those of you that have issue with communication from Council would be well aware of my intention to see this improve. Look out for my strategy to achieve this. I will always that said be ready to represent you and advocate for you when needed, to help you work your way through the bureaucracy. Always a topical and emotional topic are trees. Providing Local Leadership to ensure the correct balance will the subject of a future blog. Council matters outside Clarence Park Ward and outside City of Unley. Believe it or not but there is life outside our boundary. I will explore some of these shortly. Then there is need for providing local leadership input into State and Federal issues that impact directly on Clarence Park Ward. For more detail in each of these areas, and others, watch for my blogs on each. I will share each blog on Facebook. 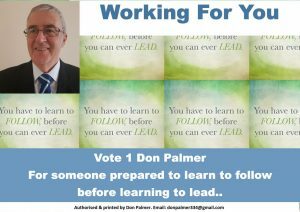 Written & authorised by Don Palmer. 19 Kelvin Avenue, Clarence Park. It is natural for me to be Providing Local Leadership and Working For You in Clarence Park. Why? I am Clarence Park. I live, play, socialise, and walk in the streets of Clarence Park. I know the trees, the streets and the footpaths, the parks and playgrounds. I know so many of its people, its clubs, associations and community groups. I am your neighbour. As your Councillor I have been Providing Local Leadership and Working For You and working with you to make our neighbourhood what it is. I am proud of what we have achieved together in the past 8 years. Above all, by representing you and advocating for you, I have helped many of you with difficulties with Council’s administration. There is more to do though, requiring continuing strong local leadership from whoever is representing you. I am still committed to working for you and providing the local leadership you expect. Certainly, the leadership necessary to ensure that Clarence Park, Black Forest and Millswood will be the suburbs of choice for our children and grandchildren. 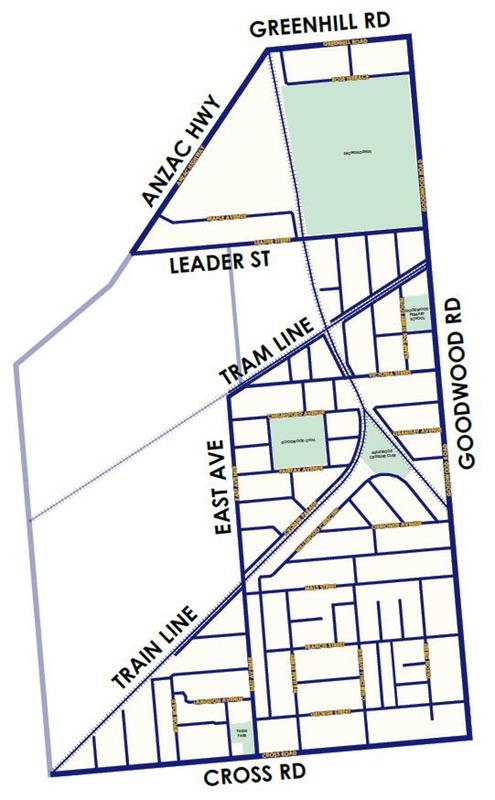 Whether it is developing the Goodwood/Millswood sporting precincts. Likewise, dealing with traffic and parking issues, or higher density housing. Certainly, better and improved communication with Council, or keeping your rates as low as possible I will represent you and advocate for you. for specific goals I believe you want me to pursue. 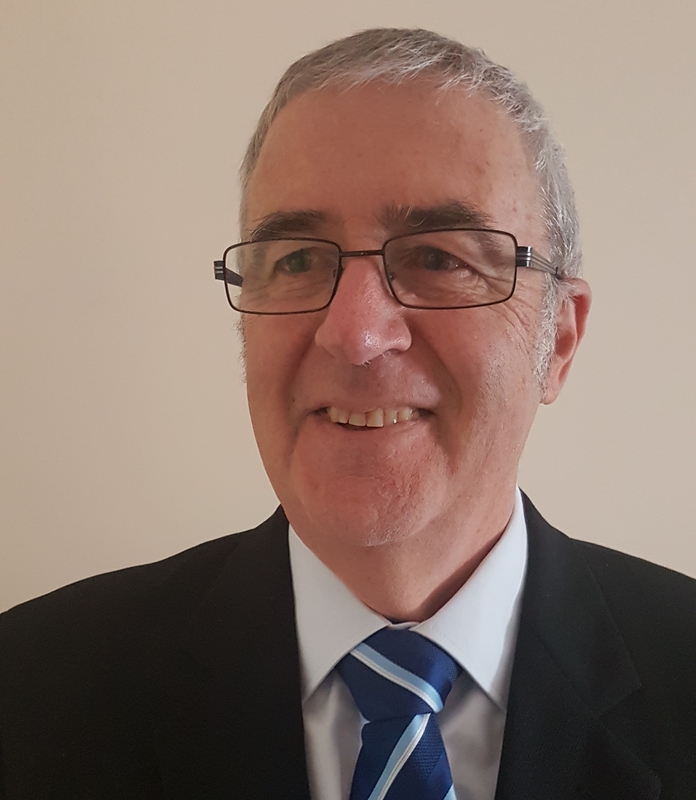 If you wish to suggest issues for me to consider please do by either ringing me on 0414820773 or by my personal email [email protected] I am unable to receive them on this website as doing so will be in contravention of the Local Government Elections ACT 1999. Local Area Traffic Management Survey back in Clarence Park Ward. A few years ago, Council experimented with a concept called Local Area Traffic Management (LATM). A concept wherein we look at traffic issues, rather than street by street but suburb by suburb. Clarence Park Ward was the catalyst in order to address issues previously identified in Black Forest. It proved a successful approach, so we opened it up to the whole city and on a ward per ward basis rather than suburb to suburb, wider again. In the next few weeks the Local Area Traffic Management Survey comes back to Clarence Park Ward. If you have not received your letter before now it will land in your letter box shortly. The area being surveyed includes the Clarence Park Ward, minus obviously Black Forest. It also includes a section of Goodwood apparently not included in their survey a couple of years back. This is your chance to highlight concerns you may have in your street or suburb. While Council is aware of some areas of concern this is an opportunity to ensure all issues are bought to our attention. What we know already is what we have learnt from you. To those of you who have communicated concerns in the past, thank you. Please reaffirm these concerns as part of the survey. Those of you who have yet to, please take the opportunity. Providing feedback will inform Council. We can then consider solutions that we can then put back to you for your further input. That said, if you have what you consider to be solutions already feel free to include that in your survey response. We look forward to your raising issues concerning traffic flow, traffic volumes, traffic speeds, rat running, Bicycle paths, shared roads (current and potential), and parking. This is Council at it’s basic. The Roads component of Roads, Rates and Rubbish. It is also Council at its basic, working with the community for the benefit of the community. Let’s make Clarence Park Ward safer and easier for us to navigate, whether by car, by bike or by foot by filling out the Local Area Traffic Management survey. Congratulations to Jayne Stinson on being elected as the member for Badcoe and to David Pisoni on being returned in the seat of Unley. I look forward to working with you both to better our local community. Councillor, Clarence Park Ward. City of Unley. Now that the dust has settled on the State election it is now time to turn our attention to Local Government. Yes! Council elections are scheduled for November this year. It is my intention to put my hand up again. 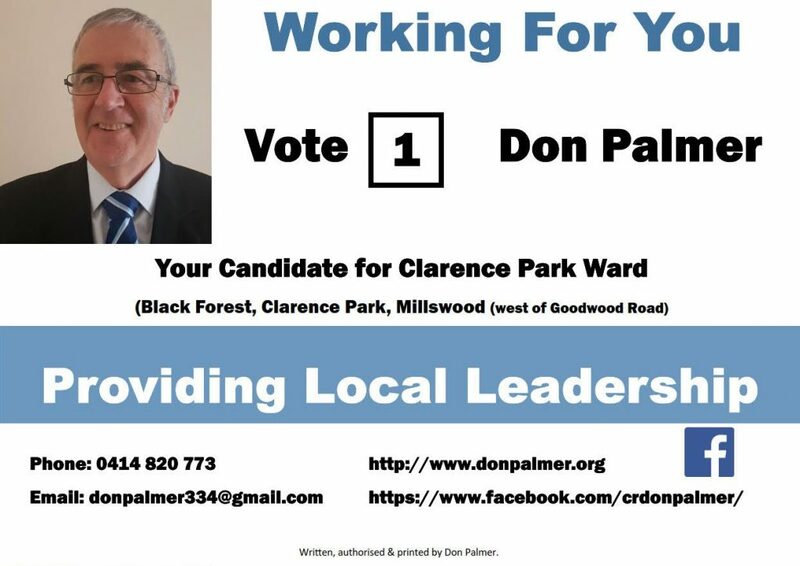 I will be looking to continue as one of your two Clarence Park Ward Councillors. Why Councillor? Why not Mayor? Many people have asked me in recent times to run for Mayor, which is certainly flattering. I believe however my true value to council and to its ratepayers is to focus on being a Ward Councillor. The elections will see a significant turnover of elected members. Two members, one being the Mayor, have already resigned. Two other councillors have announced that they will not be renominating. A fifth is considering his future. Five of 13 positions on Council will therefore see a change of member. Two, maybe three, of our current membership are considering running for Mayor. Given anyone losing the Mayoral race will not be on Council this means a turnover of 7 out of the 13 positions. If I were to run for mayor too the change will lift to 8, 9 if an outsider won the Mayoral race. Change is usually healthy. It is good to see change after each council election. New ideas, new perspective, new energy etc. If the extent of change is excessive however this can be unsettling. This is because the learning curve when stepping into the elected member role is extreme. New members therefore need time to settle in. Running for Mayor, with so many others considering it, would increase this risk. Hopefully a development application for the extended use of the lighting at Goodwood Oval does not hinder the Grandstand Redevelopment. 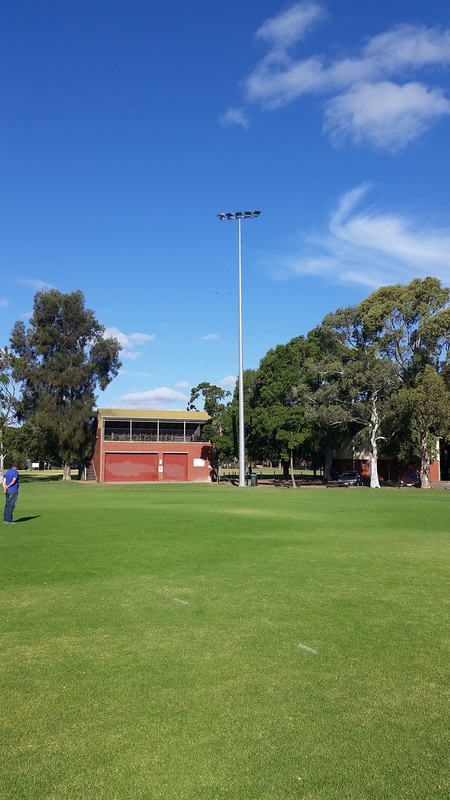 A development application for extended use of the lighting at Goodwood Oval has been submitted to Council. The timing of this application by the Goodwood Saints Football Club is poor. It will run concurrently with the consultation on the new Goodwood Oval Grandstand. This is therefore not healthy, and I suggest poor timing by the Goodwood Saints. First of all, public consultation on the Grandstand is essential to achieving good design. As a result we look to our community to contribute to the design and to take ownership of the design. Extended use of the lighting is a totally separate project. The Development Regulations deem this as development. It requires public notification, in this case a category 3 notification. Hence public involvement in this process is not one of contributing to the final design. It is one of representing (positively or negatively) on the suitability of a predetermined design by the applicant. Cat 3 notifications means anyone can submit a representation to the Panel. Our Council Assessment Panel (CAP) will assess the application. The Regulations require this. This is not just a social issue. It is an infrastructure issue. Council itself will be providing a submission to the CAP. This will focus on the Oval’s ability to handle any extra use resulting from the extended use of the lighting. With the history of opposition to the extended use of the lighting, the application is surely poorly timed. It has the potential to cause a backlash on the Goodwood Oval Grandstand design. My earlier blog expands on what we are looking to achieve together on the Grandstand. The extended use of the lighting is a what do you think about this. Hence I implore anyone wanting to have a say to separate the two. My earlier blog focuses on the Grandstand redevelopment. You can provide a submission on either or both. Therefore, your choice. Council is seeking your feedback on draft designs we have recently developed for the new Goodwood Oval Grandstand. After consultation with the footy and cricket clubs to ensure we have captured their needs, we now seek your input. As everyone knows, we received Government funding late last year. Their contribution added to our own commitment and the contribution of the clubs and the SANFL. This therefore means the project will proceed. That is a non-negotiable. What we need now is to develop and refine the concept designs. To ensure the new facility fits in with the local environment we look forward to the contribution from the wider community. Seeking your feedback will assist the final design. Discussions I have had neighbours have identified a couple of suggestions that I believe will improve the design. Both aesthetically and functionally. A question has also been raised as to the availability of function area to the community. Another whether the change rooms might be available to others who may hire the oval. I like that too. Please contribute. Your input may prove to be just as helpful. You can help by going to our have your say website. At the same time, we are seeking further input from the SANFL and the AFL. They have made observations that will positively impact on the size and cost of the project. Such observations as the number of toilets can be reduced and physio space likewise reduced. Hopefully a development application before council for extended use of lighting by the Goodwood Saints Football Club will not detract from helping us achieve the best design. The lighting use has nothing to do with this consultation. Council, must under the Development Regulations, process this application. Our Council Assessment Panel will assess the application. Please do not mix the two. We need your feedback to the grandstand design. If you have an interest in the lighting please refer to my separate bog. Providing Local Leadership and Working for You in the Clarence Park Ward since 2010. Elected Member City of Unley Clarence Park Ward. 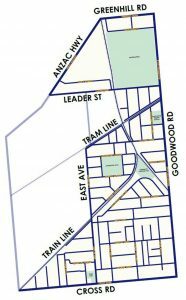 Representing you and advocating on your behalf since 2010 in Clarence Park, Black Forest and Millswood (west of Goodwood Road). All comments on this blog site are either written by or authorised by Don Palmer. They represent my own personal views and should not be viewed as the views of the Unley Council. Copyright 2019 Cr Don Palmer.